Ethan Hawke - Mason Sr. 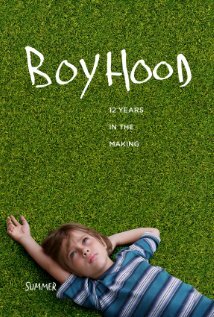 The film was called The Untitled 12 Year Project before it was titled as Boyhood. Rating: 10/10 This is life! This film blew me away and it is hard to describe why. Seeing it together with 1,500+ captivated and enthusiastic people at one of the Berlinale Friedrichstadt-Palast screenings surly helped. Yet, what makes this film so unique and touching is its deep humanity. Although it is a fictional piece, you can't help not to relate to the actors as if it would be a documentary. Every scene feels like real life. I know that this is not necessarily a good thing to say about a movie but it is meant as a compliment. The actors deliver an outstanding performance. While much has already been said about the main characters, I was also deeply impressed by the performance of the side characters as well. As an example, the actor of the second husband of Olivia excels in one of the most emotionally straining scenes of the movie. The dialogs are touching and feel just natural. There are so many scenes and details in the movie where you feel unbelievable close to the actors. When Patricia Arquette says as mother Olivia "I thought there would be more" you instantly think about your own (family) life and its constant flux. I surely hope that this movie will make it to as many screens as possible. Also, I hope that no distributor will force additional editing on it. It is perfect as it is and worth any minute. If you like people in general and families in particular, you will love this movie.